A full-featured DVD player, the DVF-3080-S sports a variety of functions to make the most of your home entertainment system. The progressive-scan capability means that you can watch ultra-clear and realistic picture on HD-capable televisions. The DVF-3080 plays CD-R, CD-RW, and MP3 formatted discs, and can also be used to view digital photos on your TV. A full complement of features includes camera angle selection, bookmark, parental control, dialog language function, programmable memory, random play for CDs, repeat play, search, slow motion, and frame advance. Onscreen menus and multilanguage tools make it easy to use. The handful of inputs and outputs--including component video, composite video, and S-video--let you connect the DVF-3080 to your television or audio system. It also comes with a full-function remote control (with 2 included AA batteries). The Kenwood HTB-S610 home theater in a box has all the basics you need to set up a home theater without having to deal with pesky wires. The HTB-S610 uses RF technology to wirelessly network the A/V receiver, five speakers, and subwoofer, with a vast operating range of up to 100 feet. The RF receiver unit has a built-in amplifier for the speakers, so you can enjoy movies at home with cinema-quality sound. 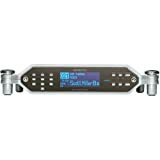 A digital tuner is also included, with 40 station presets, and automatic and manual tuning. 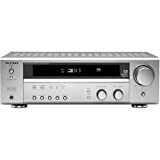 The receiver provides Dolby Digital EX, DTS-ES, and Dolby Pro Logic IIx to transform two-channel music sources (like CDs or radio) into 7.1-channel with depth and clarity. Bass management, bass boost, and audio DSP listening modes give you control over the sound so you can tailor the settings to your needs. The five speakers pump out 100 watts each, and the subwoofer (with 100 watts power) gives richness and depth to music and movies. 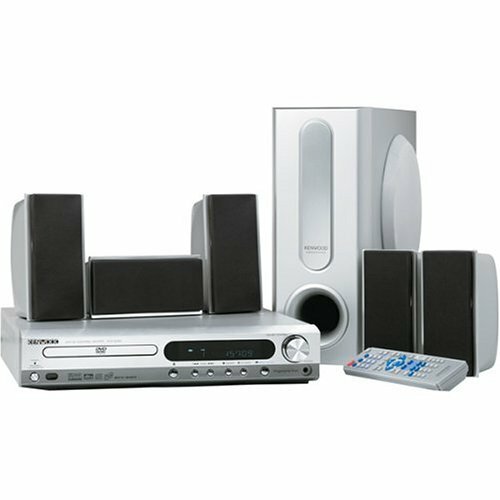 Connect a DVD player, satellite tuner, or other components with the variety of input and options. 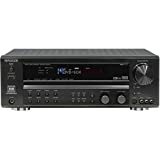 Audio connections include one coaxial and one optical digital audio in, four stereo analog audio inputs, one optical digital and one stereo analog front panel AV/Aux input, and a pre-out for subwoofer and surround back left and right. Three composite video inputs, one front-panel composite AV/Aux input, one composite video monitor out, and one composite video record out round out the video connections. The Kenwood HTB-S715DV home theater in a box is the perfect system for gamers who want fast and easy integration between their console and home entertainment system. The HTB-S715DV comes outfitted with a front-panel game audio/video input that automatically recognizes when you turn your game console on and instantly configures the correct sound processing. It also comes with a preprogrammed universal remote control with built-in Xbox and PlayStation2 codes. And if you want to play games while the family listens to music, you can slip on headphones and enjoy Dolby Headphone processing for 5.1-channel surround sound for the complete gaming experience. Fire up the DVD player and enjoy progressive-scan clarity on your HD-capable television, along with lifelike 6.1-channel surround sound with Dolby Digital EX and DTS-ES 96/24 surround sound, and Dolby Pro Logic IIx. The six speakers pump out 130 watts each of crystal-clear surround sound, and the subwoofer gives extra richness to movies with its 100 watts of power, all via the PurePath digital power amplifier. The single-disc DVD player can play back a variety of formats, including DVD-R/RW, DVD+R/RW, VCD, CD, CD-R/RW, and MP3/WMA-formatted discs. DVD features include parental control, bookmark function, JPEG Photo CD Viewer, programmable memory, random, repeat, search, still, slow motion, and subtitle functions. 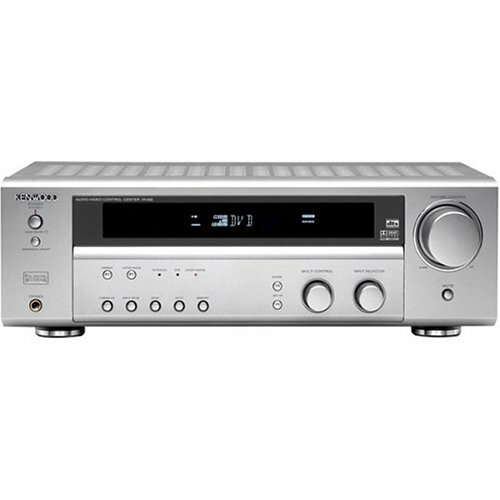 The HTB-S715DV features a huge assortment of input and output options. There are two HD-compatible component video inputs, one composite front-panel AV/Aux input, one composite front-panel game video input, three composite video inputs, one component and one composite video monitor output, and one composite video record output. Audio connections include two coaxial and two optical digital audio inputs, headphone jack, and six total stereo analog audio inputs. The Kenwood HTB-S310 home theater in a box has all the basics you need to set up a home theater with outstanding sound with sleek and modern styling. 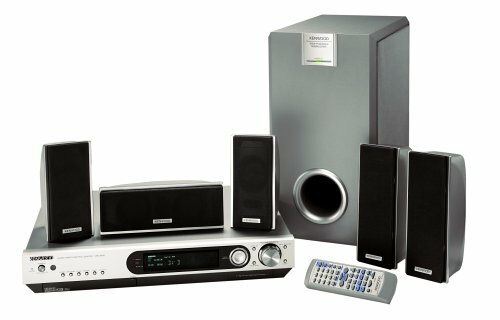 With an A/V receiver, five speakers, and one subwoofer, you can enjoy movies at home with cinema-quality sound. A digital tuner is also included, with 40 station presets, and automatic and manual tuning. The sleek Kenwood DT-7000S brings Sirius satellite radio to your home and connects directly to your stereo system--whether that be a receiver, a shelf system, or a pair of powered speakers. The DT-7000S features a 4-line blue-on-black dot matrix display with dimming control, up to 80 station presets, and a 24-song memory. Note that the DT-7000S requires a Sirius home antenna in order to receive satellite radio signals. You can store a total of 80 presets in 4 banks (20 presets each), as well as store song title and artist name for 24 songs for easy recall later. Using the Song Seek feature, an alert appears on the DT-7000S display when a saved song is playing on another station (also called a stream). The display shows a read-out of channel number, name, category, preset bank and number, artist, and song title. You can control the DT-7000S via the supplied remote control, or use the two jog dials on the front of the device to scroll through either individual channels or Sirius radio categories (such as rock, jazz, sports, or news). The DT-7000S offers both RCA composite A/V and optical digital audio output. Sirius satellite radio is a subscription service that provides up to 100 channels of programming, from digital-quality music to news, talk, and sports. It is available only in the lower 48 states--not available in Alaska, Hawaii, or U.S. territories. Kenwood's HTB-N815DV home theater system features a 6.1-channel audio/video receiver equipped with a rear-panel Ethernet jack, a front-panel PCMCIA card slot, and special features for video gamers. 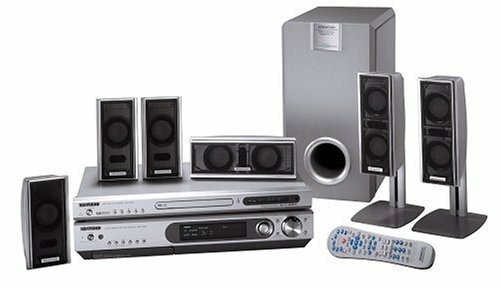 Besides the high-tech, aluminum-paneled receiver, the system comes with a single-disc DVD player, 6 slim-design Kenwood speakers (including tower speakers for front left/right), and a 100-watt powered subwoofer. Throw in color-coded speaker cables and easy-to-follow instructions and you've got everything you need to integrate your PC with your home theater along with everything you need to enjoy your movies, music, and digital photos to the fullest. The HTB-N815DV includes front-panel game system inputs, dual-source/single-zone audio, and Dolby Headphone processing for simulating 5.1-channel surround sound in standard stereo headphones (not supplied). The stand-alone DVD player offers progressive-scan video outputs for high-definition and HD-ready TVs and compatibility with MP3/WMA audio files and JPEG photo CD playback. The core of Kenwood's sleek, Fineline receiver is its Ethernet connection, which allows it to stream audio and video media files in real time from a PC via a wired network. Compatible streaming audio and video files include MP3, WMA, WAV, Ogg Vorbis, MPEG-1, MPEG-2, and XviD. The receiver will also display still images that are stored on a PC (in JPEG, GIF, PNG, and BMP formats) or on flash-memory cards inserted in the system's PCMCIA card slot. The front-panel PCMCIA card slot accepts media card adapters, too, so you can even display pictures from digital cameras over your home theater. Onscreen GUI operation makes it easy to find and play all your digital media. Pumping out 780 watts maximum (130 watts x 6) from its PurePath digital amplifier, the system delivers efficient, stable power while generating minimal heat. The system is equipped with cutting-edge features such as 6.1-channel Dolby Digital EX and DTS-ES decoding and 7.1-channel processing via Dolby Pro Logic IIx. The receiver's large, bright, 4-line fluorescent display is easily readable in bright or dim lighting. The included universal preprogrammed remote is ready to go with Xbox and PlayStation2 codes. The receiver sports easy-access gaming inputs (including a digital-audio input) on its front panel and a dual-source listening mode that allows someone on headphones to listen to one source--a video game, for example--while others are listening to, say, music over the system's speakers. The ADI SHARC 32-bit DSP processor and high-resolution digital volume control give the HTB-N815DV incredible accuracy at all signal levels, from the loudest explosions to the most delicate musical passages. Dolby Headphone technology simulates 5-channel surround sound through any stereo headphones, giving you the sense that the sounds you hear are originating around you rather than inside your head, a common effect of standard headphone listening. The full-featured single-disc DVD player spins the latest media formats, including DVD-R, DVD-RW, DVD+R, and DVD+RW. In addition it plays conventional CDs and CD-R/RWs brimming with MP3/WMA music files or JPEG photos. Seven speakers, including 6 new slim-design speakers and a 100-watt, 6.5-inch powered subwoofer, are provided. The front left and right channel tower speakers use four 2.75-inch woofers and .75-inch tweeters, while the center speaker and 3 surround speakers each use a pair of 2.75-inch woofers and a .75-inch tweeter. All components and speakers are finished in a metallic silver, matching the styling of most TV monitors, including the increasingly popular flat panel video displays. 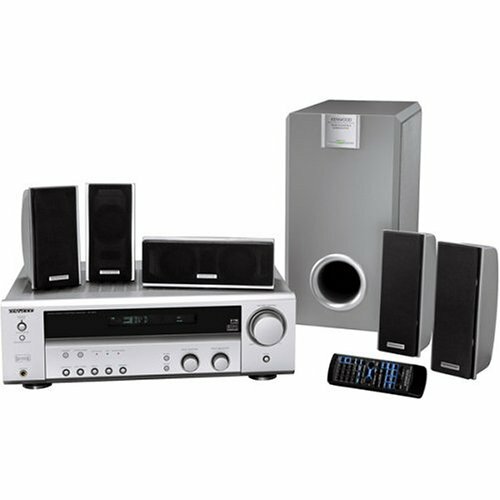 The Kenwood HTB-307 home theater in a box has all the basics you need to set up a home theater with outstanding sound. 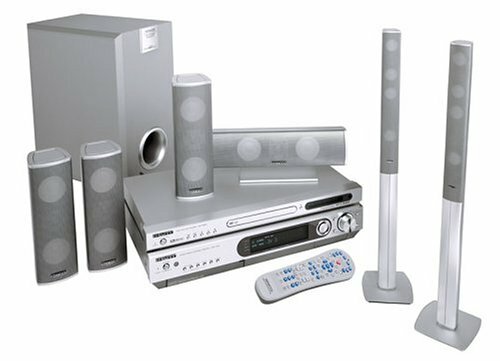 With an A/V receiver, five speakers, and one subwoofer, you can enjoy movies at home with cinema-quality sound. 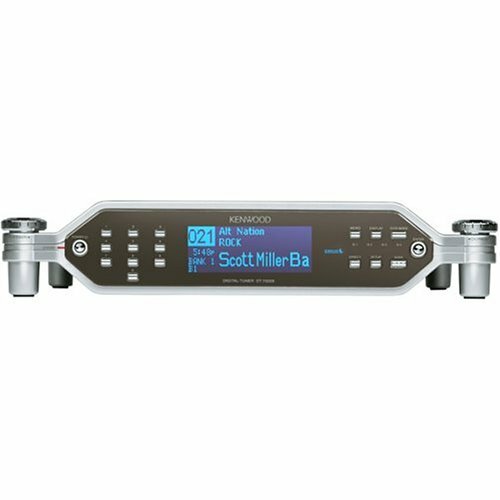 A digital tuner is also included, with 40 station presets, and automatic and manual tuning. 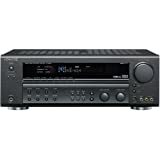 The receiver provides Dolby Digital, DTS, and Dolby Pro Logic II 5.1-channel decoding for both movies and music. Bass management, bass boost, and audio DSP listening modes give you control over the sound so you can tailor the settings to your needs. The five speakers pump out 100 watts each, and the subwoofer (with 100 watts power) gives richness and depth to music and movies. 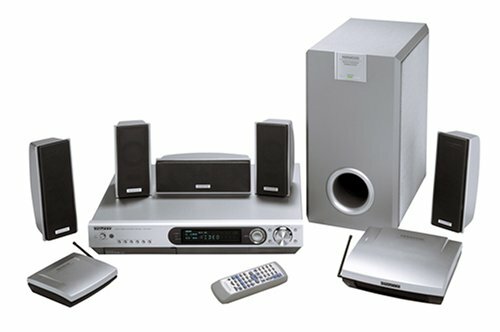 Connect a DVD player, satellite tuner, or other components with the variety of input and options. Audio connections include two coaxial and one optical digital audio in, six stereo analog audio inputs, and a pre-out for the subwoofer. Three composite video inputs, one composite video monitor out, and one composite video record out round out the video connections. 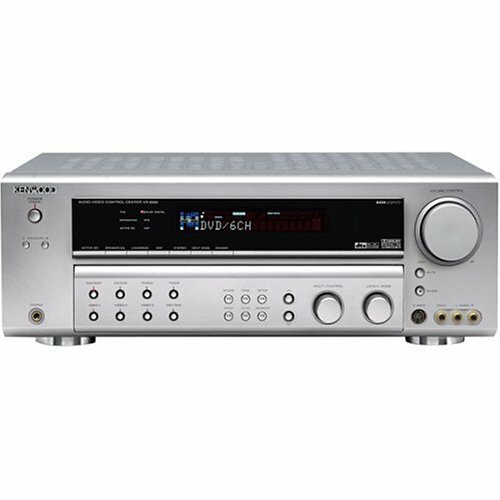 The 6.1-channel Kenwood VR-8060-S is loaded with the high-end surround-sound processing features Dolby Digital EX for delivering up to six, independent soundtrack channels and DTS-ES (Discrete, Matrix, Neo:6) to take advantage of the latest in digital audio and video. For listening to ordinary 2-channel sources like CDs, VHS tapes and even FM radio, Dolby Pro Logic IIx creates realistic 7.1-channel surround sound. The VR-8060-S sends 100 Watts into each of six channels, while its K-STAT Discrete Audio Amplifier, a Kenwood exclusive, helps to ensure the highest possible signal purity for better sound without interference. A 32-bit ADI SHARC DSP processor gives the VR-8060-S incredibly accurate performance at all signal levels. DSP (digital signal processing) simulates different environments to make audio a more life-like listening experience. A full complement of AV inputs/outputs (including component and S-Video, four digital inputs, and a digital output) makes it easy to connect all of your digital and analog components. Plus, the 8060-S has video up-converting from composite to S-Video that simplifies connections and operation by eliminating the need for separate audio and video cables. The VR-8060-S has full digital bass management letting you set up your system so that deep bass gets sent only to the speakers made to handle it, reducing distortion and increasing dynamics. 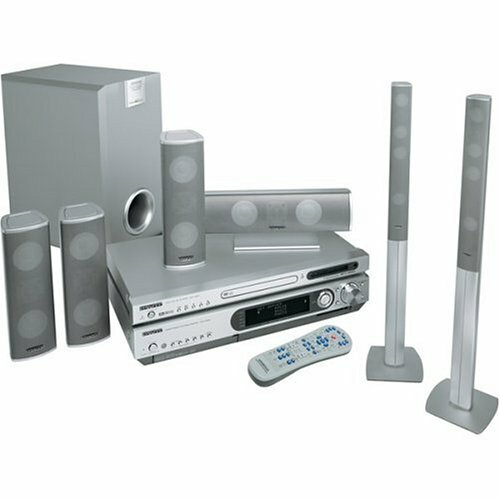 The included universal pre-programmed remote controls the receiver, your TV, VCR, DVD player, cable or satellite tuner, and select audio components. And with direct input source selection you can go directly to the component you want to use without having to scroll through each individual input. 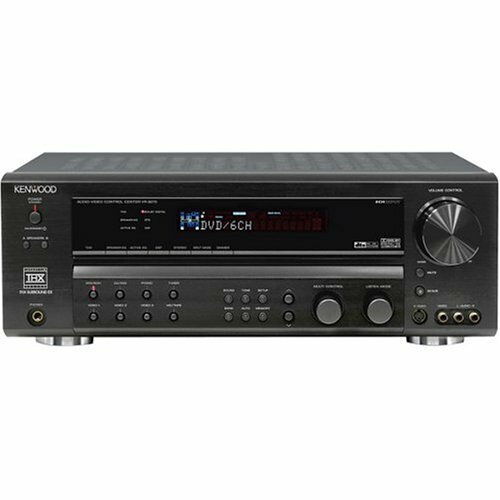 The 7.1-channel Kenwood VR-8070 is loaded with high-end surround sound processing features including THX Cinema Mode, THX Surround EX, Dolby Digital, and DTS-ES (Discrete, Matrix, Neo:6) to take advantage of the latest in digital audio and video. For listening to ordinary 2-channel sources like CDs, VHS tapes and even FM radio, Dolby Pro Logic IIx creates realistic 7.1-channel surround sound. The VR-8070 sends 100 Watts into each of seven channels, while its K-STAT Discrete Audio Amplifier, a Kenwood exclusive, helps to ensure the highest possible signal purity for better sound without interference. A 32-bit ADI SHARC DSP processor gives the VR-8070 incredibly accurate performance at all signal levels. DSP (digital signal processing) simulates different environments to make audio a more life-like listening experience. A full complement of AV inputs/outputs (including component and S-Video, four digital inputs, and a digital output) makes it easy to connect all of your digital and analog components. A second set of audio/video outputs allows you to use the receiver's features in two areas at the same time.Plus, the 8070 has video upconverting from composite to S-Video that simplifies connections and operation by eliminating the need for separate audio and video cables. The VR-8070 has full digital bass management letting you set up your system so that deep bass gets sent only to the speakers made to handle it, reducing distortion and increasing dynamics. The included universal pre-programmed remote controls the receiver, your TV, VCR, DVD player, cable or satellite tuner, and select audio components.The IR sensor input and IR repeater outputs let you use the included universal pre-programmed remote to control your entire system even if the receiver is placed in a cabinet, or other non line-of-sight location. Kenwood's DVT-6300-H home theater system delivers big-time home theater performance when you don't have lots of space to spare. The result? An affordable package that's simple to set up and use. The system comes with a 5.1-channel audio/video surround receiver, a single-disc DVD player, 5 Kenwood speakers, and a 100-watt powered subwoofer. Throw in color-coded speaker cables and easy-to-follow instructions and you've got everything you need to enjoy your movies, music, and digital photos to the fullest. The DVT-6300-H's stand-alone DVD player offers progressive-scan video outputs for high-definition and HD-ready TVs and compatibility with MP3/WMA audio files and JPEG photo CD playback. 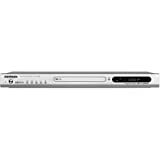 The full-featured single-disc DVD player spins the latest media formats, including DVD-R, DVD-RW, DVD+R, and DVD+RW. 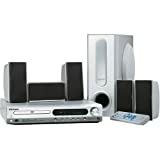 In addition it plays conventional CDs and CD-R/RWs brimming with MP3/WMA music files or JPEG photos--great for enjoying music from your PC in your living room, and perfect for producing custom slideshows of your digital photos. Pumping out 275 watts maximum (55 watts x 5) from its digital amplifier, the system delivers efficient, stable power while generating minimal heat. The system is equipped with cutting-edge features such as 5.1-channel Dolby Digital and DTS decoding, as well as Dolby Pro Logic II processing, which generates 5.1-channel audio from any stereo input, including VHS and audiocassette tapes. Receiver connections include 2 composite-video inputs to accommodate inputs from additional components, such as a DVR, VCR, or cassette deck. All 5 of the system's speakers are sonically matched to deliver a realistic surround soundfield that puts you right in the middle of the action. The powered subwoofer features a built-in 100-watt amplifier and 6.5-inch driver in a ported enclosure, pumping-out thunderous bass. The satellites and center speaker each uses a single 2-inch driver. All components and speakers are finished in a metallic silver, matching the styling of most TV monitors, including the increasingly popular flat panel video displays. The included remote controls the receiver and DVD player. 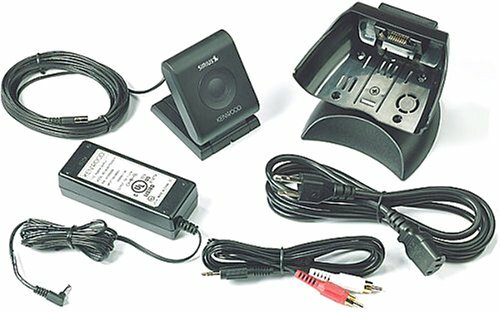 A snap to install, Kenwood's KPA-H2H Here2Anywhere home docking kit comes with everything you need to listen to your KTC-H2A1 Here2Anywhere portable Sirius satellite radio tuner through your home or office stereo system. You get a docking cradle with an adjustable base, an AC power adapter, an audio cable, and a weatherproof indoor/outdoor antenna that's easy to mount. Use of the included antenna within a home requires placement at a north-, west-, or east-facing window (depending on where you live). If a proper window location is not available, the antenna must be placed outside the home away from overhead obstructions. In an entertainment center on a shelf by itself, my H2A seriously overheast after about two hours of use. The signal usually is lost and I have to shut it down for 20-30 minutes to get the reception to work again. The provided antenna has a 21 foot long cord. Check your desired location and what window/exit you want to mount the antenna on (the antenna has to face toward the Mason/Dixon Line or face "up" if you are in a state in the center of the country near the Mason/Dixon Line). The short cord length can seriously limit where you put the system. A 50 foot extension cable is listed as an extra cost accessory but finding someone who both carries it and has it in stock is difficult. The antenna provided with the kit works adequately indoors. Best reception however requires an external mount (especially in Missouri where the unit has to face "up"). The provided antenna is not very rugged so fails to work in rain, etc. There is a high gain antenna available as an extra cost accessory but again, the trick is finding someone to sell you one. Great radio sirius is a great service . Kenwood's UBZ-LH14 FreeTalk radio is a sleek little Family Radio Service unit that can handle all 14 FRS channels along with 38 subcodes per channel, making it ideal for crowded environments. It offers plenty of features and great expandability. The radio isn't the smallest we've seen, and its three AA batteries add to the weight, but we're certain most users will be able to overlook these minor drawbacks once they start tapping the FreeTalk's abilities. For example, a scanning function automatically finds free channels, eliminating the typical trial-and-error process. And although the FreeTalk doesn't have many buttons cluttering its face, there are many advanced options that can be configured through a hidden menu. The FreeTalk's many features are spelled out in the well-written manual, and we needed only a few minutes to set up the radio once we learned what the cryptic menu entries stood for. The menu let us change call tones, enable the automatic power off feature, and eliminate the beeps that sounded every time a key was pressed. 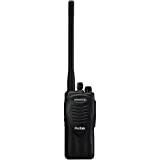 The FreeTalk can even tell if a member of your party has wandered out of range, a feature we typically don't see on FRS devices in this price range. Portability is enhanced by a swing-down antenna that stows behind the unit, a testament to the unit's carefully considered physical design. The rubber-coated push-to-talk button is easy to press, yet difficult to press accidentally. The microphone and external speaker jacks are covered by separate rubber plugs that keep them nice and clean when the peripherals are not attached. Kenwood even threw in a belt clip. This is a good radio, as I have used it for the past year. Solid range, though it won't do two miles unless it is line of sight. I like the privacy settings. I was in Hawaii...and this radio is water resistant and was able to survive getting dunked a few times. Gaskets on the batter compartment, etc. Not too many frills, but works well. 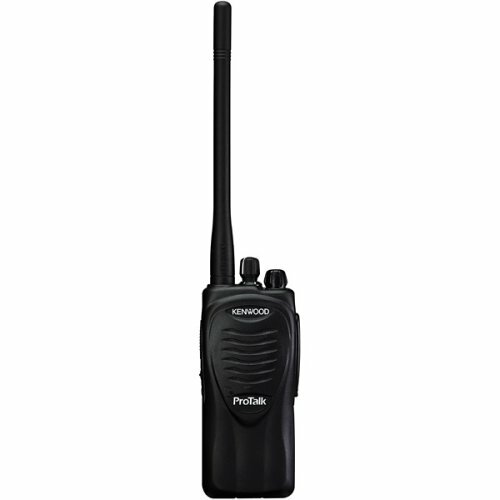 I was looking for a versatile, durable, and dependable FRS radio for when I go camping or fishing and this is it. The sound is very clear and there are many built-it options that can be changed by the user. Most of these options are for if you have two or more of these units - which would be the ideal case. But if you want just one great FRS radio, make it this one. I bought mine through DealCat.com and was very satisfied. We use 10 of these units for communications for swim meets between the starter, judges, bull pen and computer operations. We are very pleased with the performance and also like the "scramble" feature since we are using in a foreign country. I bought about 7 different models of FRS radios. This particular Kenwood model is about the best you can get. It has good range, excellent voice clarity, good ease of use, good battery life. That said, NONE of the consumer FRS radios has really loud sound. So, if you're at a noisy event (sports, etc.) you'll have a tough time communicating. Works great, but low on accessories. We have used these little talkies more than we ever expected to. Even in our house! We've been on several vacations where these buggers saved the trip. They are especially convenient when you want to take two cars and need to meet someplace. But all of that could be said of other top brand radios I suppose. I like these because the antennae flip down for when you stuff 'em in your pack and they look cool. They are durable; we've had no problems with ours. They come with a detachable belt clip which is useful and solid. They are, as I understand it, compatible with Motorolla brand radios too, so you can mingle with friends on the slopes etc. Clear sound. Multiple, multiple frequencies that are simple to choose from. A general downside to all these radios is that they say 2-mile but are 1-mile range if you are lucky. So allign your expectations. The Kenwood HTB-S710DV home theater in a box is the perfect system for gamers who want fast and easy integration between their console and home entertainment system. The HTB-S710DV comes outfitted with a front-panel game audio/video input that automatically recognizes when you turn your game console on and instantly configures the correct sound processing. It also comes with a preprogrammed universal remote control with built-in Xbox and PlayStation2 codes. And if you want to play games while the family listens to music, you can slip on headphones and enjoy Dolby Headphone processing for 5.1-channel surround sound for the complete gaming experience. Fire up the DVD player and enjoy progressive-scan clarity on your HD-capable television, along with lifelike 6.1-channel surround sound with Dolby Digital EX and DTS-ES 96/24 surround sound, and Dolby Pro Logic IIx. The six speakers pump out 130 watts each of crystal-clear surround sound, and the subwoofer gives extra richness to movies with its 100 watts of power, all via the PurePath digital power amplifier. The single disc DVD player can play back a variety of formats, including DVD-R/RW, DVD+R/RW, VCD, CD, CD-R/RW, and MP3/WMA formatted discs. 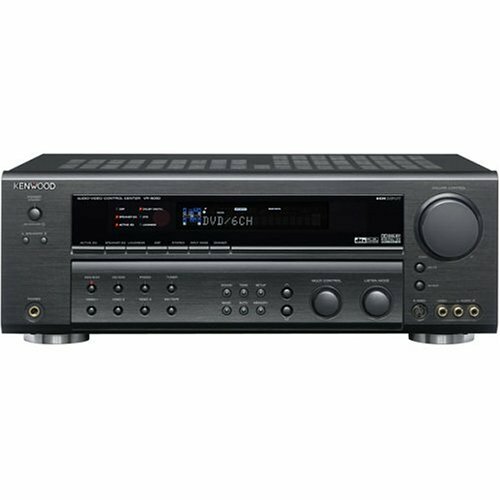 The HTB-S710DV features a huge assortment of input and output options. There are two HD-compatible component video inputs, one composite front-panel AV/Aux input, one composite front-panel game video input, three composite video inputs, one component and one composite video monitor output, and one composite video record output. Audio connections include two coaxial and two optical digital audio inputs, headphone jack, and six total stereo analog audio inputs. The 6.1-channel Kenwood VR-8050 is loaded with the high-end surround-sound processing features Dolby Digital EX for delivering up to six, independent soundtrack channels and DTS-ES (Discrete, Matrix, Neo:6) to take advantage of the latest in digital audio and video. For listening to ordinary 2-channel sources like CDs, VHS tapes and even FM radio, Dolby Pro Logic IIx creates realistic 7.1-channel surround sound. The VR-8050 sends 100 Watts into each of six channels, while its K-STAT Discrete Audio Amplifier, a Kenwood exclusive, helps to ensure the highest possible signal purity for better sound without interference. A 32-bit ADI SHARC DSP processor gives the VR-8050 incredibly accurate performance at all signal levels. DSP (digital signal processing) simulates different environments to make audio a more life-like listening experience. A full complement of AV inputs/outputs (including component and S-Video, four digital inputs, and five composite inputs) makes it easy to connect all of your digital and analog components. Plus, Active EQ tailors the receiver's response to bring the best sound out of whatever type of speakers you have (full-range, satellites, etc.) depending on what you're listening to--movies, music, or TV). The VR-8050 has full digital bass management letting you set up your system so that deep bass gets sent only to the speakers made to handle it, reducing distortion and increasing dynamics.